Giant intracranial aneurysms (GIA) (>25 mm) are treacherous lesions with a grave prognosis. They are problematic because of their wide atheromatous necks, involved branches, thrombus, calcified walls and complex anatomy. Yet, patients with GIA need treatment; if they are left alone, the outcome is dismal. The grave natural history is due to neurological deterioration or death caused by subarachnoid hemorrhage, ischemic events, or progressive mass effect seen in over 65% to 100% of cases over 2 years., In the International Study of Unruptured Intracranial Aneurysms (ISUIA), the rate of SAH for very large or giant aneurysms was found to be as high as 10% per year. The goal of treatment of GIA is to exclude the lesion from the circulation while preserving the parent vessel and function in the neural tissues. The decision making depends on multiple variables, e.g., age, presentation, neurological status, aneurysm size, morphology and location. The morbidity and mortality rates for microsurgical treatment of unruptured GIA vary between 20 and 45%, depending on the location of the aneurysm and the patient's age. Elderly patients and posterior circulation lesions tend to have a poor outcome. Good or excellent outcomes following surgery are seen in 61 to 87% of patients. Patients who become symptomatic with SAH and mass effect have the worst surgical outcomes. Endovascular treatment (EVT) is associated with high failure rates in GIA due to the unique morphology of the aneurysm; and, due to the fact that coiling of a broad-necked aneurysm may result in herniation of coils into the parent artery lumen. Hence, adjuncts like balloon and stent-assisted coiling techniques increase the feasibility of treatment but at a high price, which includes the additional risk of parent artery ischemia, perforation of the wall, distal thromboembolism and occlusion of adjacent perforators and branch arteries by the lattice of the stent. Darsaut et al., reported a higher morbidity and mortality rate of 23% and 20%, respectively, after an EVT as compared to a peri-procedural morbidity and mortality rate of 15% and 14%, respectively, following microsurgery of very large and giant aneurysms. Moreover, they also found the EVT to be a contributory factor for a higher incomplete occlusion rate of a large-to-giant aneurysm. The microsurgical solution is more durable, economical and avoids the use of long-term antiplatelet medication. The various technical advances that have helped us in tackling many of the GIAs microsurgically are the utilization of skull base approaches, the use of little or no brain retraction, the introduction of novel clipping techniques, the utilization of endoscopic assistance to visualize perforators and completeness of aneurysm occlusion, utilization of various revascularization techniques for vessel replacement, use of adenosine asystole to soften the aneurysm before its clipping or in the case of its premature rupture, and very rarely, a hypothermic cardiac arrest. Concurrent technological advances, a preoperative three-dimensional digital subtraction angiography, intraoperative microvascular Doppler and indocyanine green (ICG) angiography, have also helped. Proximal ligation/trapping without revascularization: Symptomatic GIA of proximal/cavernous ICA that needs treatment may be managed with simple ICA ligation in the neck without revascularization. This is especially appropriate for elderly patients having an excellent collateral circulation and those who tolerate balloon test occlusion (BTO). The procedure is simple, has a low risk potential and is economical. Proximal ligation/trapping of the parent artery with external carotid-to-internal carotid artery (ECIC) bypass: Parent artery sacrifice and an ECIC bypass is a particularly useful option for GIAs on the ICA proximal to the ophthalmic artery. The indications include a young patient, bilateral aneurysms, recent-onset subarachnoid hemorrhage, BTO intolerance. Excision/decompression of the aneurysm, aneurysmorrhapy and bypass: GIAs are known to present with mass effect, and hence, may need decompression before securing its neck, especially in the case of thrombosed aneurysms. A temporary protective bypass in such an instance to maintain circulation during the anticipated prolonged temporary clipping will go a long way to prevent post-operative ischemic complications. Excision of the aneurysm and various novel in situ bypasses are other excellent options. Direct clipping: Clipping techniques like tandem clipping, aneurysmorrhaphy with various combination of clips, such as the fenestrated clips and booster clips, permit successful occlusion of many aneurysms. Adenosine asystole has been an excellent adjunct to soften the aneurysm before its definitive clipping. It is important not to compromise the parent artery when occluding these thick-walled GIA. Leaving a little redundancy at the neck of the aneurysm rather than a snug application of the clip at the neck, as is done in the much commoner, small saccular aneurysm, is safer. Intraoperative ICG angiography, endoscopic assistance and Doppler flow studies have significantly helped in confirming the patency of parent and branch arteries as well as in documenting complete occlusion of the aneurysm. Occasionally, we have performed a protective bypass to maintain circulation when prolonged temporary clipping was anticipated so as to avoid ischemic injury to the patient. Combined microsurgery and EVT: Some GIAs mandate a combination of planned microsurgery and an EVT. Two scenarios can necessitate such an approach: I. An early EVT with partial coiling of the aneurysm in a sick patient to protect the aneurysm with partial occlusion, followed by a definitive microsurgical clipping; or, II. Post microsurgical clipping the small residual aneurysm left behind, to prevent compromise of a branch or perforator, can be safely coiled later-on, resulting in a satisfactory outcome. Microsurgical clipping under deep hypothermic circulatory arrest: In spite of significant advances in hypothermic cardiac arrest, the technique is challenging and has a significant risk of mortality and morbidity. Hence, it has been infrequently utilized in the author's practice and has been limited to a few giant basilar trunk or basilar top aneurysms. 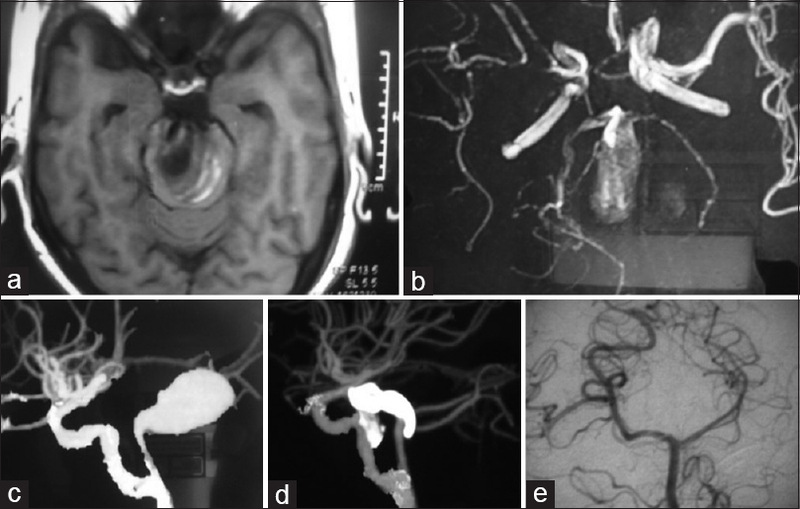 It was a pleasure to go through Dr. Sekhar's experience in the article ‘Very large and giant intracranial aneurysms: Results and complications’ in the current issue by Zeeshan et al. The authors report their microsurgical experience in 73 patients with very large and giant intracranial aneurysms. While majority were in the anterior circulation, a significant number (18%) were in the more difficult posterior circulation. SAH was the presentation in 32% patients, and 68% of aneurysms were unruptured. All of the posterior circulation and 79% of anterior circulation aneurysms were managed using arterial bypass with occlusion, hence bypass was the preferred option in most of the cases in their series. They reported a good outcome in 80% (modified Rankin scale [mRs] 0-2) of patients undergoing microsurgery. The mortality and morbidity rates were 8% and 12%, respectively. A poor outcome was directly proportional to a poor preoperative neurological condition after SAH. They also reported multiple series in literature supporting microsurgery for GIAs, showing an excellent-to-good outcome (mRs score 0–3) in 58% to 84%, and a mortality rate of 14% to 22%. Dr. Sekhar is one of the pioneers of bypass techniques and their preference to utilize a bypass procedure in their series of GIA is understandable. Dr. Lawton also advocates a heavy reliance on bypass techniques and an indirect giant aneurysm occlusion for the management of GIA, though only 38 per cent of their GIA were treated with bypass techniques. We have used direct clipping more frequently than the bypass techniques in the management of GIA. [Figure 1] and [Figure 2] Cantore et al., in their study, concluded that surgical clipping remains the gold standard for GIA and if this fails or is contraindicated, the high-flow EC-IC bypass is a viable surgical option. They confirmed in their study that outcomes were directly proportional to meticulous intraoperative control of vessel patency during direct surgical clipping and during the high-flow EC-IC bypass surgery. The commonest cause of complication in their series was closure or occlusion of an afferent or efferent vessel, or both. The clipping strategy should involve placing of multiple clips in tandem as the technique imparts a relatively high closing force, hence ensuring complete occlusion and also permitting the design and reconstruction of the parent vessel. The use of fenestrated and booster clips gives more flexibility in clipping these difficult aneurysms. Those patients presenting with TIAs, having a poor baseline condition, with the size of the aneurysm ≥25 mm, and an age ≥50 years, have been shown to have a poor outcome. 75% of poor outcomes were due to postoperative strokes. Whatever the approach being utilized, it is essential for the neurosurgeon to be well versed with the various options like microsurgery, EVT, and observation, in the treatment of GIA. Management should be tailored to the given patient so that results of any intervention are expected to be better than the natural history of the disease. Recent advances in EVT make it an attractive option for the treatment of GIA. However, the high incidence of incomplete treatment, delayed complications, recurrence, and inadequate long-term follow-up data after treatment with flow diverters still makes microsurgery the treatment of choice in GIA. Skull base approaches, neuro-protective measures, adjuncts like adenosine-induced cardiac standstill, rapid ventricular pacing, extracorporeal circulation, intraoperative indocyanine green angiography, endoscopic assistance, and the innovative use of clips and various bypass techniques, have made it possible to achieve satisfactory results in the majority of GIA, and consequentially an improved long-term outcome that is better than the natural history of the disease. Misra BK. Treatment of giant intracranial aneurysms: What is the best option? Neurol India 2015;63:138-41. Misra BK, Warade A, Purandare H. Giant intracranial aneurysms: Microsurgery. In: Singh VP, Nair MD, editors. Progress in Clinical Neuroscience Vol 29. Thieme; Delhi 2014. p 122-42. Drake CG. Giant intracranial aneurysms: Experience with surgical treatment in 174 patients. Clin Neurosurg 1979; 26:12-95. Darsaut TE, Darsaut NM, Chang SD, Silverberg GD, Shuer LM, Tian L, et al. Predictors of clinical and angiographical outcome after surgical or endovascular therapy of very large and giant intracranial aneurysms. Neurosurgery 2011;68:903-15. Zeeshan Q, Ghodke BV, Juric-Sekhar G, Barber JK, Kim LJ, Sekhar LN. Very large and giant intracranial aneurysms: Results and complications. Neurol India 2018;66:1747-51. Sughrue ME, Saloner D, Rayz VL, Lawton MT. Giant intracranial aneurysms: Evolution of management in a contemporary surgical series. Neurosurgery 2011;69:1261-71. Hanel RA, Spetzler RF. Surgical treatment of complex intracranial aneurysms. Neurosurgery 2008;62 (Suppl 3):1289-97.